We specialize in students with learning differences. Irlen Syndrome, formerly known as Scotopic Sensitivity Syndrome (SSS), is a processing issue that causes the brain to misperceive visual information. Words and numbers can appear to be fuzzy, unstable, fading, or even seem to disappear. If you or your child fall within the quarter percent of the population who is affected by symptoms which can include light sensitivity, visual processing difficulties, reading fatigue or inefficiency, productivity lapses, headaches, and/or attention-based or sustained concentration issues, you may be experiencing a processing abnormality that can easily be corrected. 46% of people who have been told they have learning disabilities or behavioral problems have Irlen Syndrome and are unaware of it. 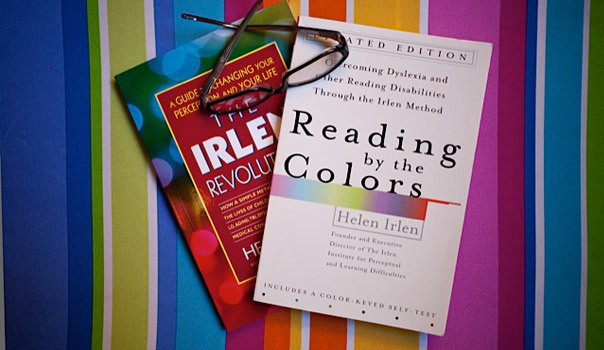 Irlen Syndrome can also affect gifted individuals and adept readers. It is not considered a learning disability since symptoms can be eliminated with color. Oftentimes the Irlen Method is one piece of the solution. Because we each have our own individual experience, it is possible that individuals can be unaware that they are misperceiving their environment. People who are unaware that they have Irlen Syndrome have often been mislabeled as lazy or unintelligent or as a ‘slow learner’. When testing for Irlen Syndrome, it is not just about getting the information correct but also about how it feels to read, understand, and absorb the information. Cindy Chanin is a certified screener for the Irlen Method, and can identify the cases of Irlen Syndrome that can be treated with simple color overlays that can be utilized immediately and with ease. For the most pronounced cases, she can also identity the severity of symptoms and provide guidance and referrals for further treatment. True to Cindy’s approach, she can bring clarity to the way each specific mind works, as well as introduce a common language to help further understanding of the Irlen Method. For more information, contact Rainbow Tutoring and visit Helen Irlen’s website: irlen.com. "Cindy Chanin is a very kind, intelligent, and hard working woman. She never gives up on her students and not only helps them, but inspires them to be the best that they can be. Cindy is not only able to help clarify the concepts students struggle with, but creates a way that is fun and memorable to learn about subjects that seem like a bore in school. In my eyes, her main mission is to help kids succeed, not only with study habits, but she also teaches valuable life skills." "With Cindy's guidance and inspiration, I was able to articulate the inner workings of my personality and put together a distinctive application that fully encapsulated who I am as a student and person. She also helped me hone my study skills and writing techniques to fit my learning style. She is a genuine spirit whose unabashed love for learning shines through in her tutoring methods. Her personalized efforts make her an invaluable resource for students of all backgrounds and academic profiles, and her vibrant personality makes her a true friend and inspiration. I cannot thank her enough."